An interpretation for the declining fish industry in world. The goal is to innovate an avant-garde operative system for a factory through mechanization. One that can ultimately function without significant stress on human labour. Defined as the rehabilitated buildings is a public realm to house the new market , this market space is realized by architecturally engineering a superstructure that encompasses infrastructure, circulation and program. The proposal aims to rejuvenate the site as a dynamic market place and tourist attraction and fish preservation that takes advantage of the low footprint whilst co-existing with the industrial fish preservation and processing happening simultaneously. 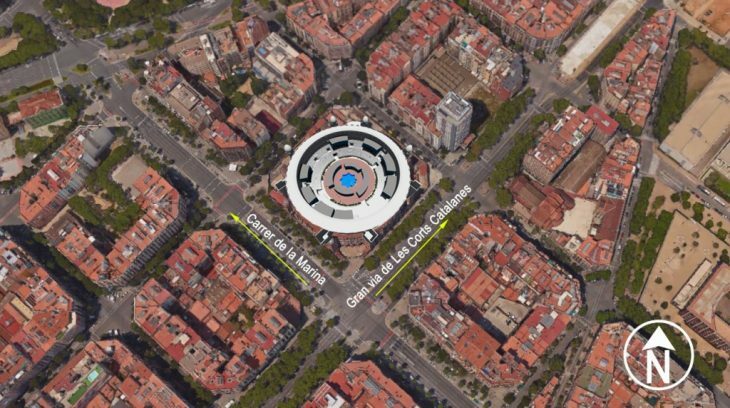 Facing two busy streets, the fisharium will have it’s Market Area (Fish) and it’s Restaurants on the these two main streets namely: Carrer De La Marina and Gran Via De Les Corts Catalanes. The inside of the monumental gives a calm experience with bringing water in the city, landscaped and open to sky hence creating the space into an aquarium and a tourist/local attraction for the people. The diagrams explains how we are moving into the La Monumental – Fisharium (Fish Industry) a place from outside a tourist/local attraction but the entire Fish Industry with related Research Labs, Fab Lab, Production, Processing, Storage, Supply and Packaging etc., are taking place along with the Preservation of different Species of Fishes in the Aquarium which are spaced inside the La Monumental grounds simultaneously at the same time.